97 or 27...any age is perfect for these beautiful Birthday Cake Cookie Favors! Our hand decorated Birthday Cookie Favors taste even better than they look! 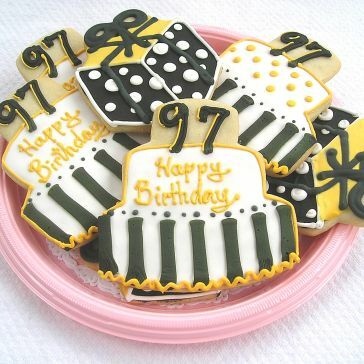 Custom cookies are a delicious and fun way to celebrate your next Birthday Party! Each custom Birthday Cake Cookie Favor comes in cellophane bag and curling ribbon. Watch their faces light up when you give them one of our delicious Birthday Cake Cookies! Ingredients for Birthday Cake Cookie: flour, sugar, butter, eggs, vanilla, almond extract, baking powder and salt. Ingredients for icing: Powdered sugar, meringue powder, gum Arabic, and cream of tarter. NO PRESERVATIVES! Our birthday cake cookie measures a generous 4 1/2" x 4 1/2" Now that's BIG!